Mary E. Pearson is the New York Times bestselling and award-winning author of ten novels. Her works include her latest trilogy, The Kiss of Deception, The Heart of Betrayal, and the forthcoming The Beauty of Darkness which will be published in August. The Adoration of Jenna Fox, and the other books in the series have been optioned for film, and A Room on Lorelei Street was a Golden Kite Award Winner. She writes full-time from her home office in California where she lives with her husband. The long rambling version . . . I have always been enamored with story and character. My mother tells me I could be the most annoying little kid, waking up each day as a new character. Every morning she would have to ask me "who" I was for that day, because unless properly addressed I refused to answer anyone. One time when I was about four years old, my parents were out shopping at Sears. They each thought the other had me by the hand when in fact I was exploring my own aisle (translation: I was lost!) Two salesladies found me and sat me on the counter, asking me my name so they could page my parents. I remember their consternation when I would only answer "Little Red Riding Hood." They couldn't shake my real name out of me no how, no way. I knew the value of persistence even then. My parents said they nearly fell over, when over the loud speaker they heard, "Would the parents of Little Red Riding Hood please come claim their child?" They knew exactly "who" was lost. These days I mostly wake up as myself, though I do seem to hang out with a lot of characters during the day. Now I write full time from my home in San Diego. I've written eight books to date and more are always on the way. The latest, The Kiss of Deception, and The Heart of Betrayal are the first books in The Remnant Chronicles trilogy. The final book, The Beauty of Darkness, will be released in August 2016. The cold quick facts version . . .
You have a book report that's due in five minutes?!? Family: Married to the man of my dreams, two lovely daughters, and two awesome sons-in-law, and three grand babies! Pets: Hunter, a golden retriever. Hobbies: Reading, of course! I also love to work in the garden. It's a great place to think about stories I'm working on. I am one of the few people I know who likes to weed. I also enjoy long walks, snow skiing, cooking, and family get-togethers, and my husband and I enjoy traveling to new places whenever we get the chance. Favorite Books: Too many to name them all, but one of my all time favorites is The Good Earth by Pearl S. Buck. I'm the dizzy roly-poly in the middle, sandwiched between my big brother and sister. The advantages of being the youngest and the "spare?" Your parents are already worn down and you get away with a lot more. Here I am at the grand age of three, trying out my first serious "author pose." "Yeah, Santa, that's a good one! And have I got a couple of stories for you . . ."
My first high school picture, but . . .
Picture this: Freshman year + Picture Day + Big Zit on end of nose. Could anything be worse for a shy14 year old? Many thanks to that dear photographer who took my picture straight on so my Mt. Vesuvius wouldn't cast a shadow across my entire face. Miracle of miracles: my mom was right that one day I would actually laugh about it. 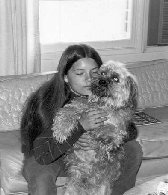 Here I am at 16, hugging my fur ball, Rags. If you haven't guessed by now, I'm a dog lover--hair, slobbers, and all. Since Rags, I've had four more dogs: Duke, Buddy, Brody, and Hunter.